The feeling of hunger is completely normal. I’m hungry means my organism notifies me that it needs food to carry on functioning. Obviously hunger regulates the quantity of food we consume, to a significant degree, and as a consequence our body weight. By having a firm grasp on when we’re hungry and what it means to be hungry we may keep our diet and weight in check. But what does it mean I comprehend my hunger? Most perceive it as a switch, now I’m hungry and wish to eat, now I’ve eaten and am no longer hungry. By using the hunger scale gradation of this feeling are introduced. The key is to recognize those gradations, by “listening” to our body, and hence eat up to what is essential while avoiding overeating. Its gradations are ten. Right from the start we have to note that one should find oneself between 3 and 6. There, at that range, it’s been observed that most people eat “comfortably”, implying they are naturally hungry and satisfy that hunger without eating too much. Again, remember that the scale is used in order to understand our feeling of hunger, its range and subtle differences. By observing our body we become more sensitive to its reactions and give it as much food as it needs, nor more nor less. Before presenting the scale let us note that anyone can make their personal scale, the one described below isn’t the only while the titles you see in bold are merely indicative. Beyond hunger. At this stage you’re starving. Your hunger is so intense that you have a headache and/or feel dizzy. You observe a lack of concentration and coordination. The lack of energy is so severe you feel the need to lie down. Very hungry. Some of the symptoms above, we see here as well. More specifically the lack of energy, the inability of concentration and dizziness. Also you feel nauseous, while you may feel irritable too. Considerably hungry. 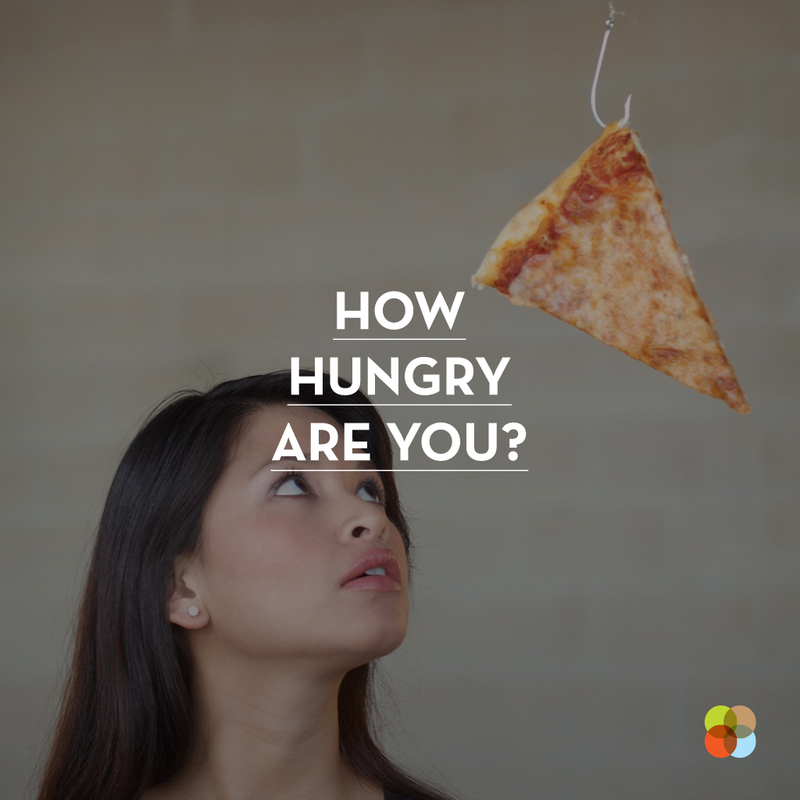 Your body clearly signals that you’re hungry. This feeling originates from your stomach, which you feel empty. Coordination wavers. The urge to eat is strong. When at this point you should eat. You should learn to recognize when you’re at 3 and 4, because if you don’t, and start skipping meals, you may easily reach gradations 1 or 2. Why is this bad? Because when there we tend to overeat well in excess of what we need. Slightly hungry. You’ve just started to feel hungry. You realize it may be time to eat. Your stomach may be grumbling. Almost satiated. Here you begin to feel you’ve eaten enough to carry on with your day. Physically and psychologically you approach the point of satiation without actually reaching it. This is a “neutral” stage we’re neither hungry nor completely full. Fully satiated. Although there may be room for more food your hunger is positively satiated. This is another critical point. Once you think you’ve reached it stop eating. By managing to stay between 3 and 6 it’s more likely to eat just so. Beyond satiation. Despite being full you keep eating. Here food consumption is guided by the brain not by the stomach. You probably begin to feel the food in your stomach. You now feel discomfort and/or stomachache. While you’ve realized you’ve overeaten. Clear feelings of discomfort, heaviness and tiredness, you are bloated and need to lie down. Beyond stuffed. You’re so overfull you’re nauseous. You can’t move and most likely you experience disgust towards food or the image of food. Concerning weight loss the scale will help you distinguish when you’ve turned to food for solace or boredom, and hence help you avoided. This is an important parameter, because those who do so, find it difficult to stop at the point of satiation and not past it. Apart from boredom, the need for solace and hunger, there are additional reasons that lead us to overeating. For instance eating in front of a TV or a PC. In the end we may say that the scale is a means to eating only as a response to hunger and not to other stimuli, which don’t represent any of our physical needs. In other words we recover our real feeling of hunger and satiation. The three instances in the title are about the period before a meal, during a meal and right after one. Again we are “alerted” to our hunger by our stomach. What does it tell you? Do you feel it empty? Concentrate at it in order to match your hunger with the right gradation. Observe what your emotional condition is when you want to eat, is it what drives you to eat? If you suspect so wait for 10-20 minutes and if you’re still hungry eat something small and low in fat like a fruit. In order to accurately evaluate your hunger make sure to drink enough fluids. That way you “isolate” the feeling of hunger from the one of thirst, since the two might be conflated, resulting in hunger seeming more severe than it actually is. Keep in mind that your body feels hunger every 3 to 5 hours after a meal. When eating it is crucial to realize when you’ve satiated yourself and stop in time. Therefore, at least when you’ve started using the scale you should eat slowly and pay attention to your body while doing so. Also, it might be useful for you to stop eating, well before your plate in empty, and check which gradation better corresponds to your level of hunger. If you think you’re at 5 or 6 you may stop, your body doesn’t need more. Don’t succumb to the pressure to empty your plate. So, this is the hunger scale plus a few ways to benefit from its use.